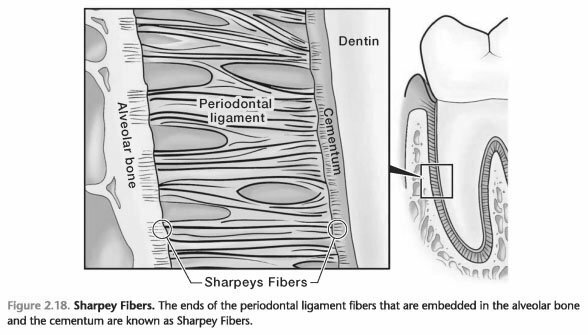 Sharpey Fibers of the Periodontal Ligament - Foundations of Periodontics: What fibers of the periodontal ligament attached to the alveolar bone? 1. The ends of the fibers of the connective tissues of parodentium, which is embedded in cement, and alveolar bone is known as Sharpey fibers (Fig. 2-18). 2. The attachment fiber bundles occurs when the cement and bones are formed. As cement, forms, fabrics around hardens the ends of periodontal fibers (Sharpey fibers) surrounding them with cement. The same process occurs in the process of bone formation. As the bone wall of the tooth socket hardens, it surrounds the ends of periodontal fibers with Bones. The ends of the fiber bundles, fall into the bone that forms around them.